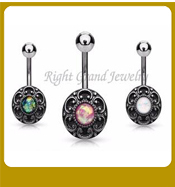 Find RG-Navel Belly Rings, Belly Button Rings , Belly Rings on Industry Directory, Reliable Manufacturer/Supplier/Factory from China. (If You Have Bigger Qty, Pls Ask Seller To Offer Discount Prices!!!!) If You Want Other Zircon Shapes, Pls Contact Seller. 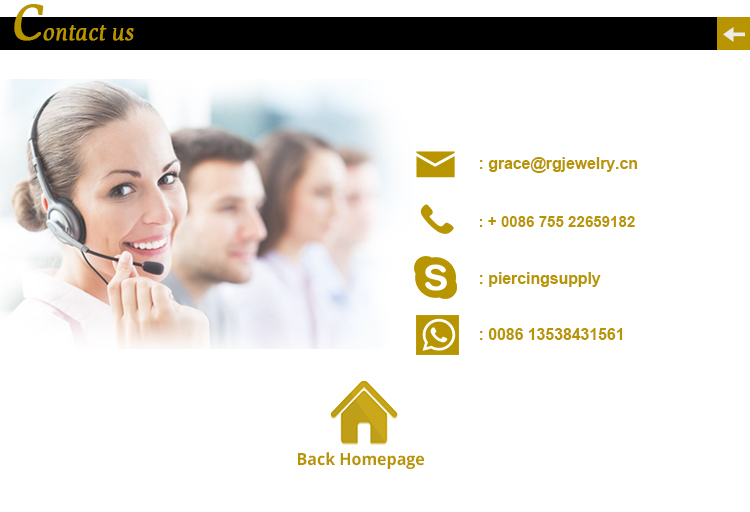 Right Grand Jewelry Factory is one of a leading manufacturers and exporters located in Guangdong, China, ..Factory covers an area of more than 1000 square meters, and has more than 50 employees. With 8 years production history, Right Grand Jewelry Factory has advanced equipements, such as 6 sets of Automatic Lathes, 4 sets of CNN machines,2 sets of laser cutting machines, 6 sets of polishment machines, welding machine and bending machine etc. Our business scope is Body Jewelry and fashion jewelry. 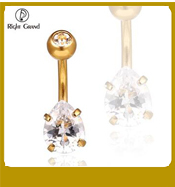 Body Jewelry scope includes Eyebrow Ring, Nose Ring, Septum,Tongue Ring, Lip Ring, Dermal Anchor, Tunnel and Plug, Fake Plug, Ear Taper, Belly Ring, and Accessories etc.Fashion Jewelry scope includes Jewelry Set, Pendants, Earring, Bracelet, Ring and Jewelry Findings. We are specialized in 316L Stainless Steel, G23 Titanium, UV Acrylic,Silicone, Wood, Stone,Glass, Brass and Zinc Alloy. We always believe Customer's requirement is the first priority, and mutual benefit relationship is the base of long term cooperation.Right Grand Jewelry Factory will do the best to offer Higher quality, Lower price, and Better service. We sincerely hope to establish mutual benefit business relationship with customers from all over the world with our high quality, competitive price and excellent service. If there is any queries, please do not hesitate to contact us. Contact us if you need more details on Star Navel Ring. We are ready to answer your questions on packaging, logistics, certification or any other aspects about Star Navel Ring Jewelry Piercing、316L Surgical Steel Cubic Zircon Star Navel Ring. If these products fail to match your need, please contact us and we would like to provide relevant information.